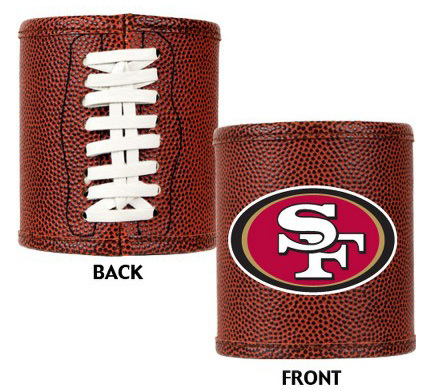 This officially licensed San Francisco 49ers NFL can cooler is made just like a real football. These NFL can coolers are awesome for game day! San Francisco 49ers / Candlestick Park Framed and Matted NFL Panorama Photograph. The panorama photo is of Candlestick Park in San Francisco on November 18, 2012. The San Francisco 49ers defeated the Seattle Seahawks 13-6. The deluxe panorama features black double matting and your choice of black or cherry frame, with a 1" x 4" engraved brass nameplate. Actual size is 40" x 14"
San Francisco 49ers / 3Com Park at Candlestick Framed and Matted NFL Panoramic Photograph. The panorama photo is of 3Com Park at Candlestick Point (End Zone) in San Francisco on November 30, 1998. The San Francisco 49ers defeated the New York Giants 31-7 in a Monday Night game. The deluxe panorama features black double matting and your choice of black or cherry frame, with a 1" x 4" engraved brass nameplate. Actual size is 40" x 14"